When will we see a gameplay movie. By the way, any other kinds of trailers? it looks very great. i like the details of the truck and the environment is so beautiful!! After extensive study of these pictures I can conclude that this Premium is digital awesomeness incarnate. Excellent work! Awesome; i think the trailer is too wide for the Renault. Nice pictures. Good job SCS. The game begins to take shape. I can not to appear. Moves in the air sleeve? Wow nice. Looks really good. All three are nice but the first is a show! Waiting at least we have something to admire every time we turn on our computers. In 3rd pic I saw that "invisible barricade" on the street in the city.I really don`t understand why do you put such a thing.Everything else is great,but that "barricade" I can`t understand since first ETS. That game is a (r)evolution. Great pictures. Can you make custom registration plate? Congratulations on the work SCS! It's amazing to see these images. Perfect. The work is better every day! ... because not all streets are meant to be driven on. If they would create only the path from one job to another, everything would be unrealistic. So, at least inside the cities, there have to be crossroads and junctions. The street emerging from those junctions are of a certain length, after which they just stop, in the middle of nowhere, after they've reached a point where they are not visible anymore. They have to be seen by the driver when passing by, to give the impression of a real town. But, if you would take one of those roads, you would end up falling over the edge, into... nothing!! So, they're blocked. To remove those barriers would mean creating an entire city for each delivery point on the map. This would mean an enormous amount of work on something that the player doesn't really need, since most of us will never drive outside the shortest route between two jobs. So, it's either the barriers or sceneries with a single, boring road, that looks artificial and not part of a real city, as it should be. I think that the trailer is too close to the cab... Jus saying. and for each case you should put the appropriate sign, dont forget to put some speed bump at the entrance of the cities. Yeah it would be really cool if it was possible to get the number plate from your starting country. And it also raises the sense of realism in the game. it's so nice!!! Go on like this... 1 copy is already buyed! Looking good, Trailer is fine attached to the Renault premium, we truck drivers out there know you can close couple trailers. I've driven trucks where I have had very little space to stand to couple the air lines and electrics, it is not too wide either. Think expectations of some people are too high and don't understand trucking or driven trucks, the more detail in the game the more computer power you need and a nigh specification PC. And what is the fascination with pedestrians and continuously posting, whoever you are do you not realise how stupid you look. If you want pedestrians walking out in front of you, narrow roads, tight turns then go have a look at OMSI and try your hand at driving a bus.. It's only one of these internet trolls, they are hard to endure, but just ignore, and he will eventually disappear. THAT PICTURES ARE AMAZING, I LIKE THE WHITE LINE IN THE ROADS AND THE RENAULT IS EXCELLENT! Especially concentrate on gameplay please! SCS PUT THAT WHITE LINE IN ALL OF ROADS! 3. nice license plate, I hope there will be come a lot of more european license plates off all countries in euro truck simulator 2, that you can choose your plate. 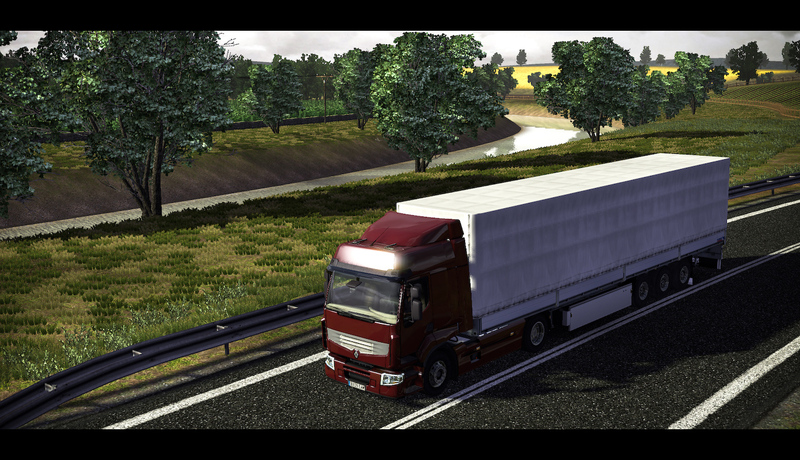 scs, how does it lokks about the E36 Motorway in Poland? Will it be in the map or not? Scs team Turkey country Ets 2 map ? No not you again, we don't want to hear a single more word about your obsession about road E36. Hey SCS, Awesome pics.......Though I Would love to see some bad weather screens !! Very very good job SCS !!! Wonderful ! Can we see the Millau Viaduct in France, will it be in the game area? Amazing images. Keep up the superb work SCS Software team. Great job SCS . I like the glow of the sun in the paint . Very real :) Keep up the great work ! WOW it's very good ! Renault Magnum and Viaduc de Millau please. First and Second screen are in The Netherlands, 3rd screen is in Belgium. Very nice truck. I love the Scania you guys have been using, but use this insteadf for a while, it is amazing. About that third picture. I would like to be able to drive through the skyscraper-filled streets. I would like to see the whole city. Whoever keeps posting PEDESTRIANS IN ETS2, shut up! Scs gets it already. I't sure there will be pedestrians. Stop hounding them. I really enjoyed these pictures, and hearing that crap is terrible. You know what, even without pedestrians this game is amazing. Once is quite enough. I'm sure everyone got the message. Let's try avoiding these annoyances, please! Please use this traffic signs in The Netherlands, only in The Netherlands (NL/Holland)!! It's to be nice. By the way: Antwerpen Airport / Aachen / Köln dear is in that direction..
Can you make that the cars can overtake in single roads? Amazing pictures! Thanks for sharing and keep up the good work! please take it into map. how does it looks with the road signs scs? 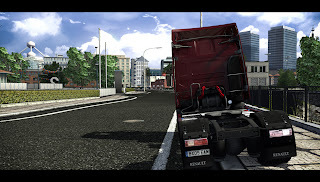 What software(s) do you use for ETS 2 developpement please? "integrate some parking place for single roads too"
State ( Country ) Border check to pass ( Something like Petrol Station ) press enter or something and wait for 4-6 sec its more realistic.... Get the Border Police somwhere near boder. THANKS. GREAT GAME ! Why roads are so clean? please make some roundabout for single roads! Spam, offensive, hateful and other inappropriate comments will be removed and authors may be permanently restricted from commenting. The latest ATS map expansion "Washington" will be published later this year. Don't forget to add it to your wishlist to be among the first to learn about its release. You’ll meander your way around lakes and rivers, and forests of pine and birch will often close upon you as you journey through these countries of quiet, subdued beauty. Welcome to the lands beyond the Baltic Sea! Go down the road to experience the wild beauty of the "Beaver State", Oregon. Its natural beauty includes deep forests, plenty of water areas and rivers, volcanoes, high deserts, and arid scrublands. Trucks & Trailers about to go "Gold"
Spoiling the driver with too much luxury? American Long Haul featured on Steam! © SCS Software. Awesome Inc. theme. Powered by Blogger.